To oversee change requires two things. In fact it isn’t change we should single out; it’s governance – full stop. Change is just a part of the whole. The whole is governance. Governance is the care of assets. Typically the care by some people of the assets of others. The care of assets should be led and managed with equal diligence and competence through both routine cyclic operations and through episodes of change. Data that we can analyse into being information that is suitable for decision making. Jump to Definitions and Jump to Data Model below. Perhaps they are both one thing. Is data the result of measuring and information the result of putting data into the model and tracing the linkages to give foresight? It troubles me is that we know our ability to lead and manage change is particularly poor. I trace poor performance to the use of models published in well known standards and text books. Our poor track record proves the old models – and I include ‘agile’ in the list – are falling short. The text books were never correct but the errors were previously unobservable and less significant than today’s volatile, uncertain, complex (emergent) and ambiguous (VUCA) world makes them. Agile has responded to the VUCA needs in development areas; a better output delivery engine. We still need better outcome and benefit delivery for performance improvements in governance over assets. Currently organisational lifespans are shrinking. Those leadership and management patterns of the past are unequal to the challenges of today. For justification, explanation and a lead-in to pragmatic guidance see >>>The #FlatEarth post here<<<). 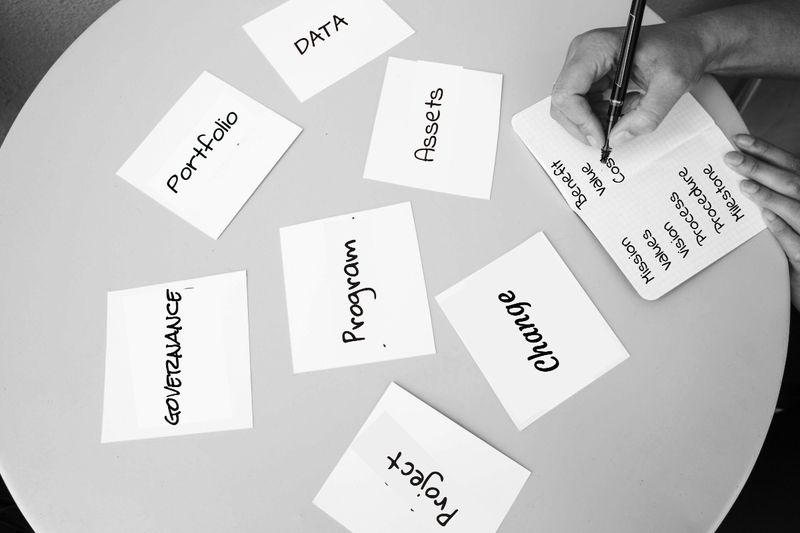 A band of Portfolio, Program and Project management consultants have for some weeks recently (Q1-2019) been building a data model to help improve the ability of organisations to capture and interpret project data for program, portfolio and governance needs. They ‘inhabit’ a linked in group (>>>Here<<<). Below is some of my thinking that contributes to the debate and model building. Our CURRENT target(s) derived from Mission plus Values plus Marketplace circumstances. When vision matches operational capability, no change is required. When vision and operational capability have gaps, changes (program/s) is/are required. Vision should be expressed with statements of the form of Benefit-Tests – “As <leader’s role> I see and hear <behaviours> in <context> on <date> at <location> that tell me we have arrived at benefits flowing” – This is a hypothesis in Effect and Cause written in hindsight terms. A decision making under uncertainty structure that leads or directs a collection of resources to transform the organisation’s current pattern of integrated asset use. It is (should normally be) comprised of at least one social engineering workstream and zero or more technical engineering workstreams and one or more workstreams that bring the integrated whole into routine operations (sun and moon based cadence). NB this is NOT the common ‘geocentric’ #flatEarth textbook definition. A role/person/committee (chair) that expresses a vision of what is to be achieved and applies resources to the pursuit of that vision. In so doing, they create accountability in themselves and responsibility in all those people with time and skill who declare they have the will to contribute to achieving the vision. Will or motivation arises because people see a benefit to themselves. A role/person who oversees repeated execution of defined procedures. In a change context they facilitate a group of people to debate how to decompose (or backcast) a received vision into descriptions of operational behaviours local to their responsibilities, decompose behaviours to the enabling social and technical prerequisites and then use received resources to achieve the resulting Tipping-Points and Milestone and Benefit-flows. The leader/manager or supervisor who integrates and adjusts social and technical enablers into Business as usual habits that maximise achievement of organisational values and mission. Initial integration creates the pre-conditions for benefit-flows. Adjustment optimises the benefit-flows; for example for maximum effectiveness or highest efficiency. A recognisable (binary: is/isn’t) point at which social and technical enablers are provably in place and integration commences. Each separately meets its creation/acquisition milestone ‘Definition of Done’. A largely operational concept aimed at achieving the most output for the least input. Note that ‘local optimisation’ as driven by poorly defined incentive schemes typically degrades the overall ROCE/EBITDA and so is NOT in the equity owner’s best interests which favour Global Optimisation. In project and program environments flexibility in the face of emergent challenges is a critical success factor. Flexibility typically requires resources assigned in readiness to react so not currently generating a visible benefits-flow. Thus ensuring survival looks inefficient – until an adaptive challenge arrives. The description of a transformation in universal ‘always applies’ terms. E.g. ‘Sugar dissolves in tea’/’Projects are authorised before commitment’. The anthropomorphic, local description of HOW a process is implemented by reference to triggers, timings, roles, authorisations, e.g. ‘Using a dry tea-spoon…’ or ‘Unwrap each lump…’/’Draft a Mandate on template M-1 and submit to the investment committee secretariat by the 12th of the month’. The point at which the results of people’s efforts demonstrably match the definition of done. (DoD is beyond just Verification. Compare with Acceptance and Validation). The confirmation that an agreed obligation has been met. Typically on Validation that a result is Fit for Purpose. The successful confirmation that a result – final or intermediate – matches its specification or ‘Conforms to Specification’. The condition created in a requester to respond to the needs of those they represent (equity owners and employees) when decisions and or resources are needed to achieve the targets that they set. Accountability is ‘for the achievement of a self-defined target. Accountability rests in one person. In ‘corporate’ structures (committees) the SPA is the chairperson. The condition created in a contributor to achieving a target when they confirm will, skill and time to contribute. A primary aspect of responsibility is to escalate instructions to act to the Accountable person when the target/vision is under threat or has opportunities from the current combination of constraints. A limit beyond which it is not possible or not allowed to proceed. Some constraints come from the laws of physics others from regulation, others from opinion, culture and habit. Constraints are irrelevant when they do not impinge on each other. When two or more concurrent constraints are contradictory then one or other HAS to be changed if mutually acceptable success is to be achieved. The detection and handling of mutually incompatible concurrent constraints is handled by the escalation aspect of the issue management process and is one of the sponsor’s key roles. Something believed and relied upon when decision making about the future (so typically within planning activities) that is taken to be true, real or certain and for which no evidence is available and which if an error of belief will materially invalidate the plan. An expression of whether final measurements will match prior predictions. All estimates should be accurate at all times – the price of accuracy is precision. It is the providers duty to ensure estimates are always accurate. It is the recipients challenge to determine if the precision is sufficient for their needs for Decision Making Under Uncertainty. The degree of variation an estimate contains within its range. Typically accurate estimates start out imprecise. The factors, relationships, historic-empirical facts used to predict some future quantity. It is the BoE not the generated range that matters (A helio-centric observation ignored in most ‘geocentric’ writings) BECAUSE a BoE is a dynamic collection of elements. At any point in time the BoE generates a CURRENT range of values. The twin objectives of a BoE are to generate stable values with a range matched to the leader’s and manager’s needs for Decision Making Under Uncertainty. Matched needs include speed with which the estimate is produced, the range required for accuracy and the stability of the accurate range. NOTE: it is common that many BoE elements are under the influence of Leaders (Target setters) Managers (Workstream supervisors) and Social/ Technical ‘engineers’. The sum total of all assets at our disposal – the most important being our people and their shared understanding of how to interact to generate benefits. We should also discuss ‘contract’, ’employment’, ‘equity’, ‘debt’ ‘balance sheet’ etc – i.e. equity, people’s efforts and debt. Together three sources of Capital and the rewards for capital’s use – Wages, Dividends and Interest. What is given up in exchange for or pursuit of some benefit. The surplus of benefit after costs. Often difficult to assess as the majority of costs and benefits related to a current or future state of operations are seen differently, contributed to differently and received differently by different people. An enabled but unexploited potential benefit stream.